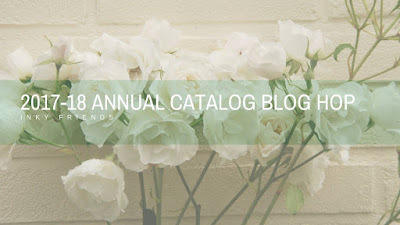 Welcome to my stop in the Inky Friends New Annual Catalog Blog Hop. We are a group of Stampin' Up! 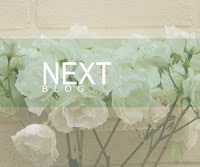 Demonstrators who share ideas, support each other, and have fun blogging! You may have come from Betty's Blog featuring one of my favorite stamp sets, A Pocketful of Sunshine. Perhaps you are hopping backwards and came from Shelley's use of Always and Forever. Or, you could be starting here. Any way you got to the hop. welcome. 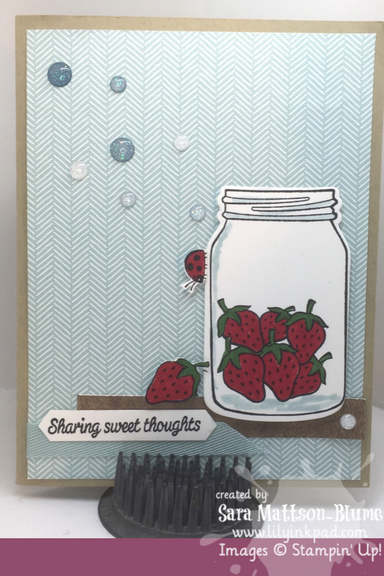 Each of use chose a new favorite stamp set to feature and I chose Sharing Sweet Thoughts. With each sale of this stamp set, Stampin' Up! donates $3 to the Ronald McDonald House Charities, which are close to my heart. I love jars. I organize in jars. I took all of my grandma's canning jars when she offered them. I love them. I also live (and grew up) in the midwest, where we give jam or jelly or other jar gifts. 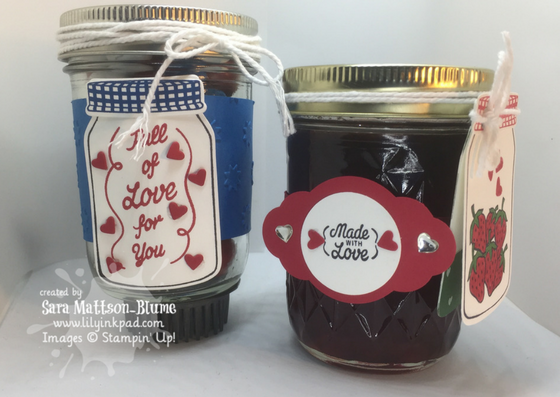 These are two jar gifts that are stampfied. The left one is to give to a hostess for a 4th of July Party. The second one, I think I got the strawberry jelly from that hostess and now can spread the love. The tag idea came from my upline, Connie Fitzgerald, who gave us treats once using that kind of tag. I just updated the design. Second: a card to go with the jelly. I love those strawberries and since it is strawberry season here in Wisconsin, I had to use my Real Red Marker to make them as red and juicy-looking as possible! I did something my brain considered crazy, on the card. Can you guess what it was? Well, I made the Soft Sky Chevron Ribbon enter my card from the opposite side as the shelf. Crazy. But I like it. Third: a fun fold card. I had to make a fun fold card. I love them. This one features a color combination chosen by my step -niece, Mekaela---Tranquil Tide, Night of Navy, Calypso Coral, and Pool Party. the butterflies are very pretty using those colors. I used markers for maximum color. The Designer Series Paper is called Naturally Eclectic. Confession: I never bought the other jar set. I wanted it, but I resisted. Now, this set has given me a full size jar. I HAD to make a bouquet card. I used the Happy Birthday Gorgeous stamp set for the flowers and stamped on the watercolor paper and then quickly brushed my aquapainter over them to make them extra-watercolory. I also painted the jar to be my favorite kind- the blue ones. 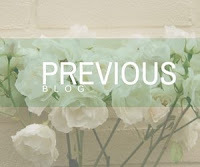 Well, I'll have more details and pictures on Sunday, but until then, you can hop around the other blogs. Click on Next to hop to Shelley's Always and Forever, and click Previous to go to Betty's A Pocketful of Sunshine. So excited - I JUST got that set and you've given me great ideas. TFS! So many great ideas, Sara! 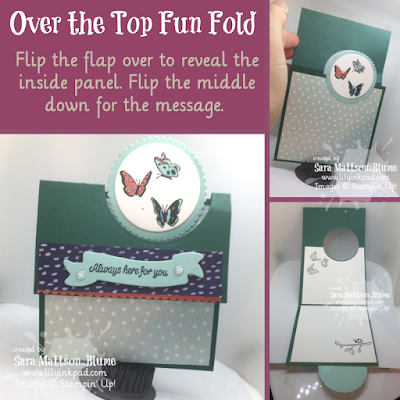 Love the fun fold with the bright butterflies. 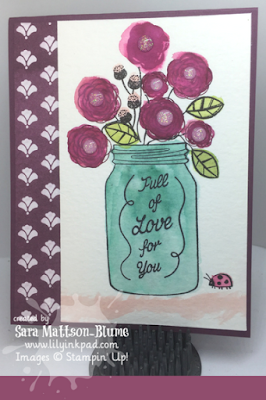 What great cards, Sara! They are all super cute. I especially love the fun fold card! Thanks so much for putting this hop together! These are SO cute and you used practically every stamp in the set! Thanks a bundle for coordinating the hop...fun to have the group (plus new friends) together again! Great creations with this set Sara! The strawberries are wonderful, and the fun fold is amazing! Sweet tags and cards! I totally get the obsession with jars. I use them ALL THE TIME! Seriously. Lily!! I love your cards!! Thank you so very much for your ideas and inspirations! How sweet are!?! They are just perfect! Thanks for sharing them!